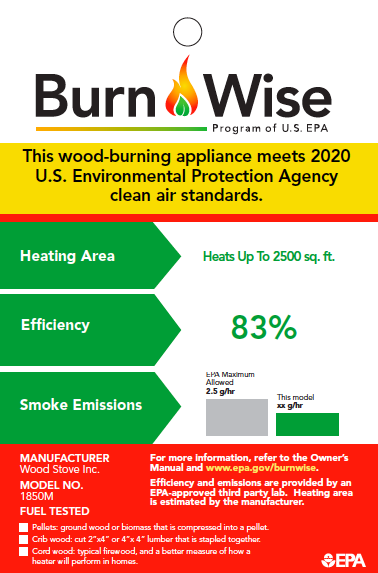 More stove manufacturers are posting third party verified efficiency numbers on the EPA’s list of certified wood and pellet stoves, giving those consumers who really care about verified efficiency numbers more options. There are now about 190 stoves, or more than 33% of all stoves, that have verified, actual efficiency numbers. The EPA list of stoves is the definitive source for efficiency numbers as most most stove company websites use exaggerated, misleading efficiencies. The Alliance for Green Heat maintains an updated summary list for a list of EPA certified stoves that disclose their actual efficiency, as tested by B415.1-10, using higher heating value (HHV). Among the nearly 190 stoves with actual efficiencies, hybrid and catalytic stoves are the most efficient, averaging 77% efficient for cat stoves and 78% for hybrids. The average non-catalytic stove is 71% efficient and the average pellet stove 74% efficient. Pellet stoves also have the greatest range, from 58 to 87% efficiency, a 29 point difference. Consumers should be aware of which pellet stove they buy. Four companies provide the efficiencies of virtually all of their stoves to consumers: Blaze King, Jotul, Kuma Stoves and Seraph. The Alliance for Green Heat commends those companies for their transparency. Kuma now holds the distinction of having the highest rated efficiency of any wood stove at 84%. ExtraFlame, an Italian company, has the highest efficiency rated pellet stove at 87%. Jotul deserves recognition as well for showing leadership in voluntarily disclosing efficiencies for 15 stoves, more than any other manufacturer. The EPA dropped the estimated default efficiency numbers on their list of certified stoves, an acknowledgement that those default numbers were both inaccurate and not helpful to consumers. (They used to assign 63% efficiency to non-cat stoves, 72% to catalytic and 78% to pellet stoves.) As of 2015, the EPA does not maintain or endorse any efficiency default numbers. Even if a company has a verified, third party efficiency value on the list of EPA certified wood stoves, many companies will continue to list efficiency values far higher on their own websites, where most consumers get their information. The Even Temp (St. Croix) Hastings is listed by the EPA at only 66% efficiency, though a brochure on St. Croix's website claims that the stove achieves 83.2% efficiency as verified by "an independent lab". The Hearth & Home Technologies company Pel Pro claims "EPA certified 89.5 efficiency" for its PP60 pellet stove, but the EPA only certified the stove for emissions, not for their efficiency. Only a handful of companies, including Blaze King, Kuma, Seraph, Travis and Woodstock Soapstone, provide the same efficiency number on their website as the independent lab reported to the EPA. Fewer companies list their official EPA test report on their website next to their product, as required by the EPA. Exceptions include J.A. Roby, Kuma, and Jotul. Click here for more on brands that consumers can trust. The EPA started to require stoves to be tested for efficiency in May of 2015. Stoves that were tested and certified before May 2015 do not have to disclose their efficiency until they are required to test again, which will be 2018-2020 for many stoves. Some of the stoves listed here were done so voluntarily by manufacturers, not because they were required to. Pellet stove companies in particular appear to be least willing to share verified efficiency numbers with consumers, possibly because their efficiency numbers are lower than the could be. The EPA began issuing a voluntary hangtag, akin to a "green label" to stoves that disclose their actual efficiency and meet the stricter 2020 emission standards. Many of the stoves on the list above will be eligible to display that hangtag on the showroom floor and the Alliance for Green Heat urges consumers to consider buying stoves that display the hangtag. Stoves sold by Blaze King, Travis and Unforgettable Fire are now approved to display this hangtag and more companies will be approved soon. How important are efficiency listings? Tested efficiencies of wood stoves give an indication of how efficient the stove can be when it is operated well with seasoned wood. Efficiency and emission numbers achieved in a lab under optimum conditions are likely the best numbers that stove can achieve, not an expected average that a consumer will get. Unseasoned wood that is over 25% moisture content will dramatically lower efficiency. More important than a 5% difference in tested efficiency is burning your stove with seasoned wood and with enough air to the firebox. Even the most clean and efficient stove can be polluting and inefficient if it is not operated well. For pellet stoves, the lab tested efficiency numbers are more representative of efficiencies you get at home, assuming you keep the stove clean. A dirty pellet stove that has not been serviced for more than 6 months is likely to get lower efficiency. The non-catalytic stoves on this list range from 60% to 78% efficiency and the catalytic and cat/hybrid stoves range from 63% to 84% efficiency. Pellet stoves range from 58% to 87%. Some companies are claiming verified efficiencies on their showroom hangtags but it is unclear if these are actually verified, HHV numbers. 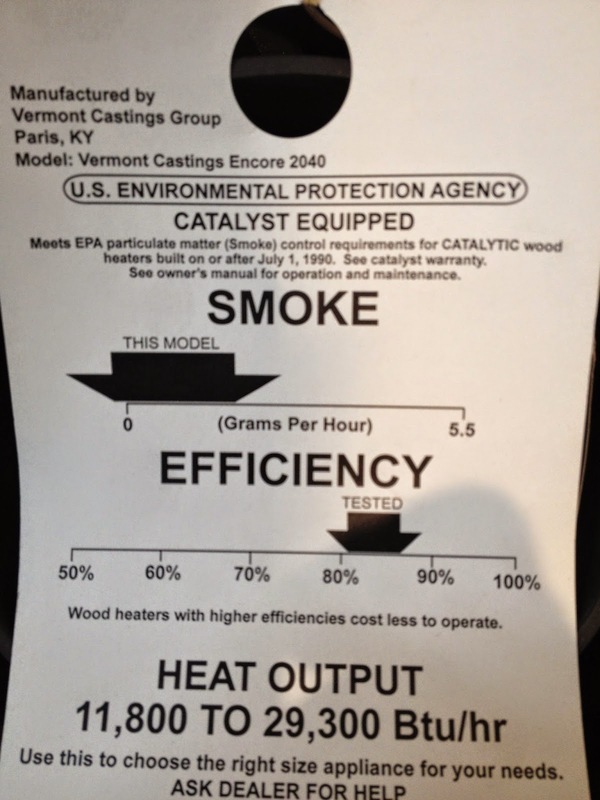 Vermont Castings, for example, and the hangtag in the showroom shows their purported tested efficiency but they have apparently not provided the a verified efficiency to the EPA for the list of certified stoves. There are about 20 companies that make pellet stoves with a verified efficiency on the EPA list, a large increase over the first time the list was updated in May 2015. Italian company Extraflame currently produces the two most efficient pellet stoves on the EPA list, at 87% and 85%. As we could not find these models for sale on the website, it does not appear that you can buy them yet in the US. Aside from Extraflame, two other manufacturers also make pellet stoves with efficiencies above 80%. One of them is Ningboa (now owned by SMG Hearth and Home), a Chinese manufacturer who sells a 81% efficient, $1,500 stove. The other is Hearth & Home Technologies with a 82% efficient stove. The Illinois-based company Seraph Industries, the first pellet stove company to voluntarily disclose its efficiencies, also makes an impressive 79% efficient pellet stove. The average efficiency of a pellet stoves is probably about 70% HHV, based on several third party studies, but many popular pellet stoves are between 55 - 65% efficient. Of the nearly 150 stoves with actual efficiencies, the lowest are pellet stoves.